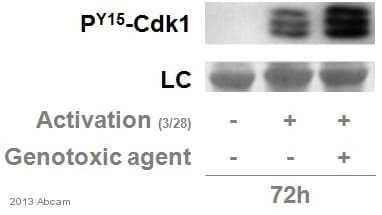 The antibody will cross-react with phosphorylated CDK1 (pY15), CDK2 (pY15), CDK3 (pY15) and CDK5 (pY15) but not with non-phosphorylated CDK1, CDK2, CDK3 and CDK5. Please see our ELISA results on the images section. Synthetic peptide (the amino acid sequence is considered to be commercially sensitive) within Human CDK1+CDK2+CDK5+CDK3 (phospho Y15). The exact sequence is proprietary. Our Abpromise guarantee covers the use of ab133463 in the following tested applications. WB 1/1000 - 1/2000. Detects a band of approximately 34 kDa (predicted molecular weight: 34 kDa). IHC-P 1/50 - 1/75. Perform heat mediated antigen retrieval with citrate buffer pH 6 before commencing with IHC staining protocol. Immunohistochemical staining of paraffin embedded human colon with purified ab133463 at a working dilution of 1 in 75. The secondary antibody used is a HRP polymer for rabbit IgG. The sample is counter-stained with hematoxylin. Antigen retrieval was perfomed using Tris-EDTA buffer, pH 9.0. PBS was used instead of the primary antibody as the negative control, and is shown in the inset. Direct ELISA antibody dose-response curve using purified ab133463 at 0-1000 ng/ml. Antigen concentration of 1000 ng/mL. An alkaline phosphatase-conjugated goat anti-rabbit IgG (H+L) (1/2500) was used as the secondary antibody. Dot blot analysis of CDK1 (pY15) phospho peptide (lane 1) and CDK1 non-phospho peptide (lane 2) labelling CDK1 (phospho Y15) with unpurified ab133463 at a dilution of 1/1000. A peroxidase-conjugated goat anti-rabbit IgG (H+L) was used as the secondary antibody (1/2500). Saso2 cells were incubated at 37°C for 24 hours with vehicle control (0 μM) and different concentrations of Amifostine (ab141060). Decreased expression of CDK1 (phospho Y15) (unpurified ab133463) in Saso2 cells correlates with an increase in Amifostine concentration, as described in literature. Whole cell lysates were prepared with RIPA buffer (containing protease inhibitors and sodium orthovanadate), 10μg of each were loaded on the gel and the WB was run under reducing conditions. After transfer the membrane was blocked for an hour using 5% BSA before being incubated with unpurified ab133463 at 1 μg/ml and ab32384 at 1 μg/ml overnight at 4°C. Antibody binding was detected using an anti-rabbit antibody conjugated to HRP (ab97051) at 1/10000 and visualised using ECL development solution. Immunohistochemical analysis of paraffin embedded human breast carcinoma tissue labelling CDK1 with unpurified ab133463 at 1/50 dilution. Immunohistochemical staining of paraffin embedded human colon with unpurified ab133463 at a working dilution of 1 in 50. The secondary antibody used is a HRP polymer for rabbit IgG. The sample is counter-stained with hematoxylin. Antigen retrieval was perfomed using Tris-EDTA buffer, pH 9.0. PBS was used instead of the primary antibody as the negative control, and is shown in the inset. Publishing research using ab133463? Please let us know so that we can cite the reference in this datasheet.